A few months ago we announced our Cities in 3D program, which is an effort to help local governments add a three-dimensional representation of their city to Google Earth. Today we’re excited to introduce a number of local governments that have taken the opportunity to participate in the Cities in 3D program and are offering the public a 3D model of their city through Google Earth. You’ll now find a virtual representation of buildings in many cities, counties, and towns across North America, ranging from the capital city of Washington, DC to the small town of McMinnville, Tennessee. The models of these cities are available in the “3D Buildings” layer on Google Earth, making information that was previously confined to government mapping professionals available to the general public through the rich, interactive environment provided by Google Earth. By providing easy access to this data, these local governments are not just benefiting their residents, but also businesses, developers, preservationists, and other local groups. Local governments can now better engage the public with land-use planning and redevelopment while fostering economic development. Enabling virtual tourism can also boost travel to these areas, as tourists can now appreciate what the cities have to offer and can easily preview their destination. 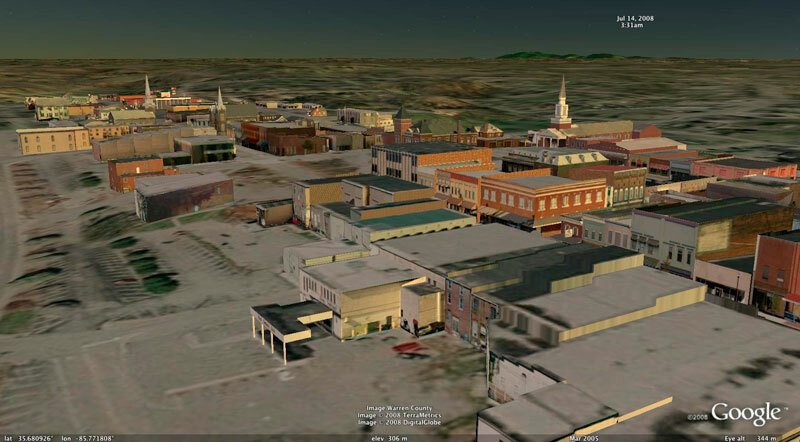 Sharing 3D models through Google Earth enables local governments to easily manage their virtual representation, and allows citizens to easily and freely access their local government’s public data. “Having 3D models of our city available via Google will provide a convenient, cutting-edge showcase for all our city has to offer, including our neighborhoods, business districts, and recreational, cultural, and entertainment amenities. This is a tool that will undoubtedly contribute to our economic development success,” said Paul Ney, Director of the Mayor’s Office of Economic and Community Development in Nashville, TN. Governments sharing their 3D models through the Cities in 3D program include Amherst, Massachusetts; District of Columbia; Greenville, South Carolina; Jamestown, New York; McMinnville, Tennessee; and the Metropolitan Government of Nashville & Davidson County, Tennessee. To view the models, simply turn on the "3D Buildings" layer in Google Earth 4.3 and fly to one of the participating localities. The 3D buildings layer on Google Earth is a collective effort to create a 3D representation of the world and provides local governments with a platform upon which to share their data with over 350 million Google Earth users. Local governments that are interested in sharing their 3D data through Google Earth can learn more about the Cities in 3D program at earth.google.com/citiesin3d.